Sun, sand, sea – and a good dose of luxury. Not unabashed luxury like at the One & Only Palmilla. Or the glam chic of The Cape, a Thompson Hotel. But definitely enough comforts to classify as a 5-star resort (at least an upscale one). We’re talking about the popular and much-loved Pueblo Bonito resorts in Cabo Sand Lucas, Mexico. 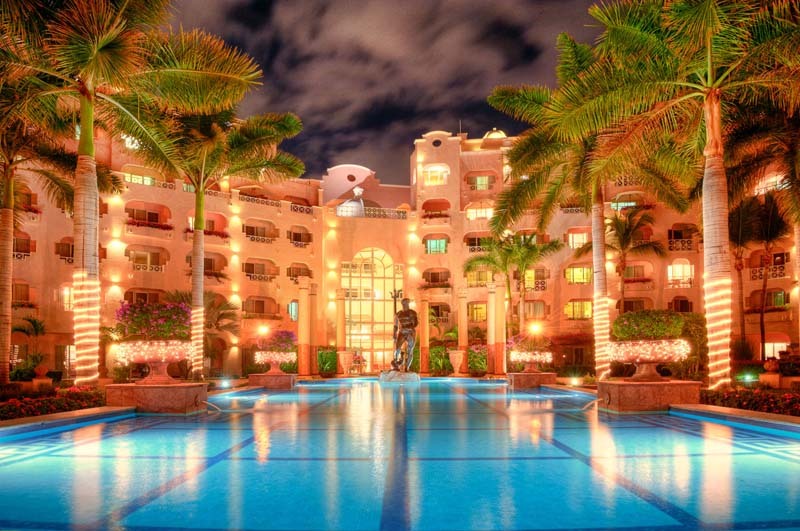 There are four Pueblo Bonito resorts in Cabo. 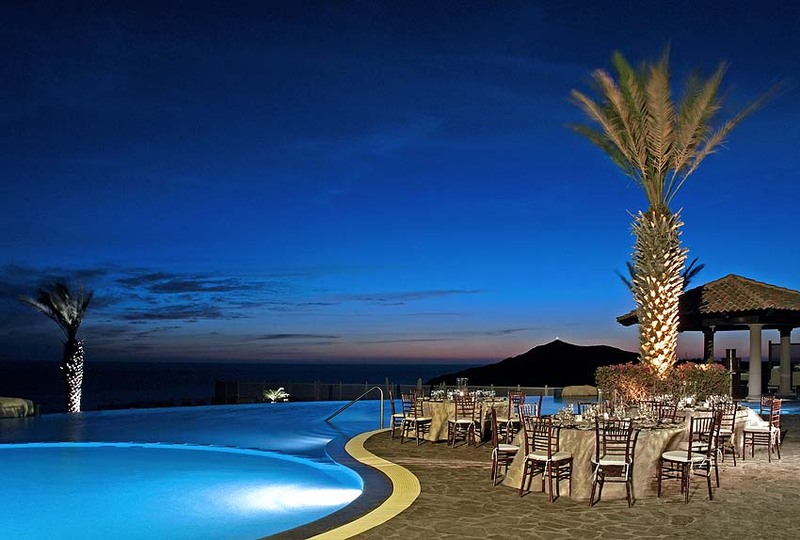 Which Pueblo Bonito resort is the best? The fourth Pueblo Bonito resort in Cabo – the Pacifica (where we’ve also stayed) – is a bit different. It’s all-inclusive and for adults only. So we haven’t included it here in these Pueblo Bonito reviews. Click here for our review of the Pueblo Bonito Pacifica – very chill! As to the other three Pueblo Bonito resorts, here are reviews. 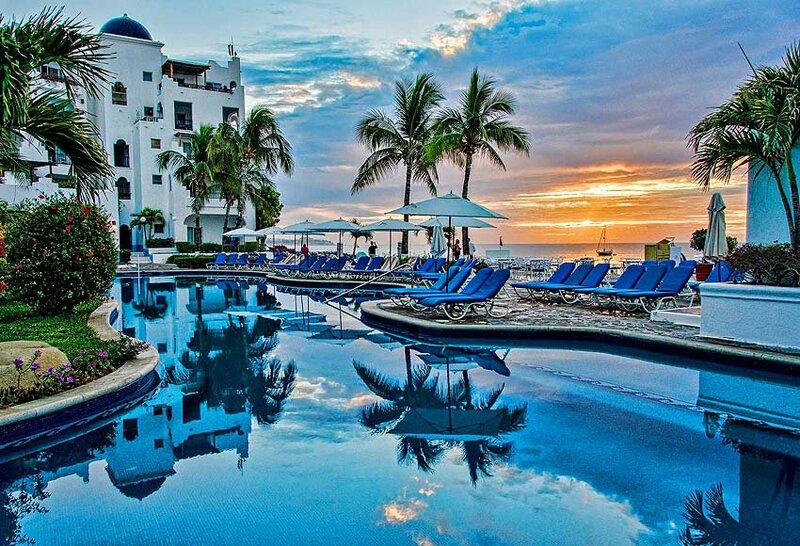 You’ll find our pick for the best Pueblo Bonito resort in Cabo San Lucas at the end. 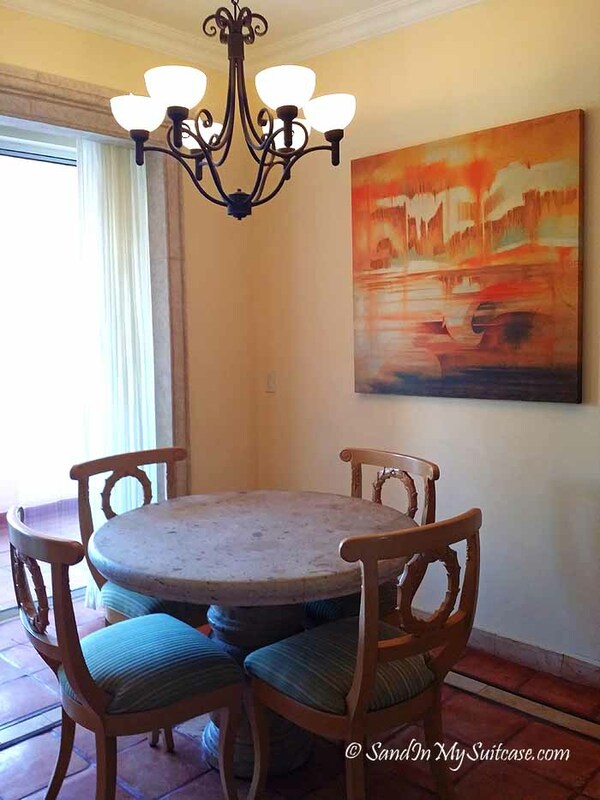 Built in 1991, the Pueblo Bonito Los Cabos was the first of the four Pueblo Bonito resorts to be built in Cabo. Mediterranean-inspired, the gleaming white property is topped with blue tile cupolas. 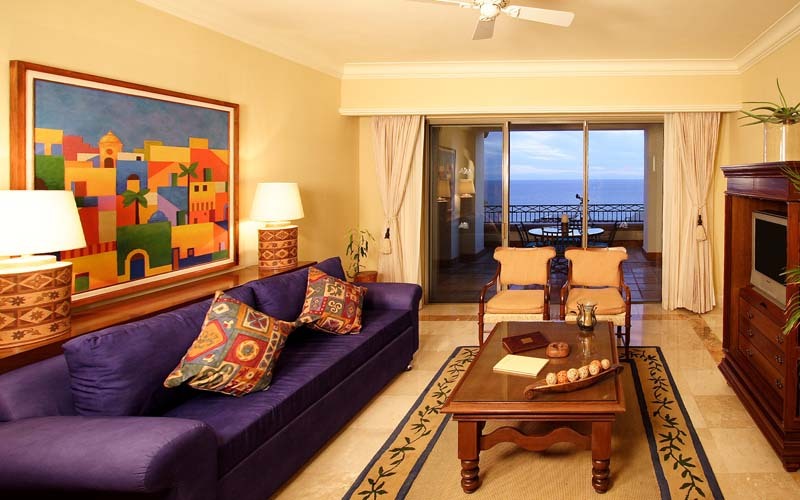 Dubbed “Blanco” (to distinguish it from the Pueblo Bonito Rose next door), it has 148 ocean-view suites, from studios (called “junior suites”) to 1-bedroom units (with 1 or 2 bathrooms) to penthouse suites. Master suites are corner units and are larger than luxury suites. The bedrooms don’t face the ocean, however (living rooms do though). If you’re content with a luxury suite or junior suite, we like the ones on the second floor with the extra-large, private balconies – which effectively double your indoor/outdoor space. These are the only balconies in the resort big enough for reclining lounge chairs as well as other patio furniture. Suites are pretty and soothing. They’re decorated with white stucco walls, light blue decorative accents, big live potted palms and kitchen cabinets that are dark blue (for junior and luxury suites) or creamy yellow (for master suites). Beautiful cappuccino-colored marble floors are inlaid with white tiles, bordered with blue and yellow tiles in a wave pattern. Outside, koi and turtle pools and parakeet cages grace gardens on either side of the resort’s lobby doors opening onto the beach outside. 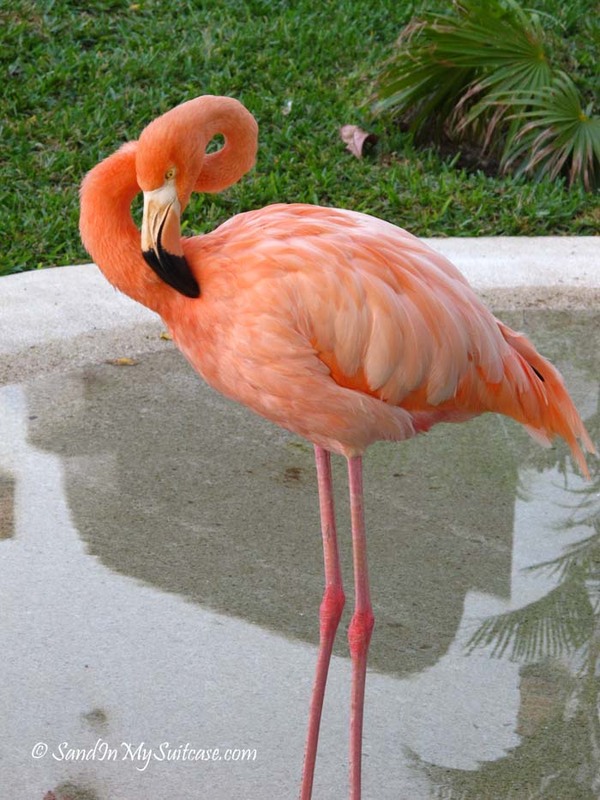 Two flamingos also reside here in the garden (we were surprised to see these two are apricot-colored, not pink). Little arched bridges cross over a winding freeform swimming pool. Beyond is the sparkling blue water of the sea and a roped off area on the beach for the resort’s umbrellas and chairs, lined up cozily side-by-side. The Blanco is located right on Medano Beach, one of the best of the few swimmable beaches in Los Cabos. Yes, there’s Medano Beach. But Cabo has other great beaches too! When looking at Pueblo Bonito Los Cabos reviews, note that for a change of scene, you have free use of the facilities at the Pueblo Bonito Sunset Beach on the Pacific side – take the free shuttle bus from the Pueblo Bonito Rose to get there. Book Pueblo Bonito Los Cabos (Blanco) now! 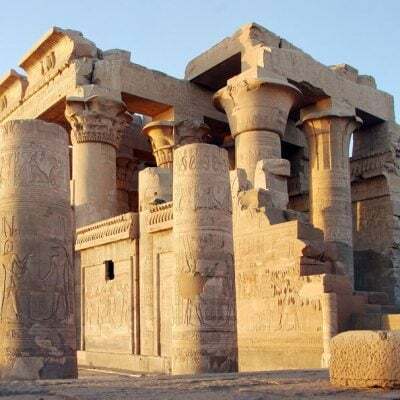 You almost expect toga-clad nobles to be padding about. 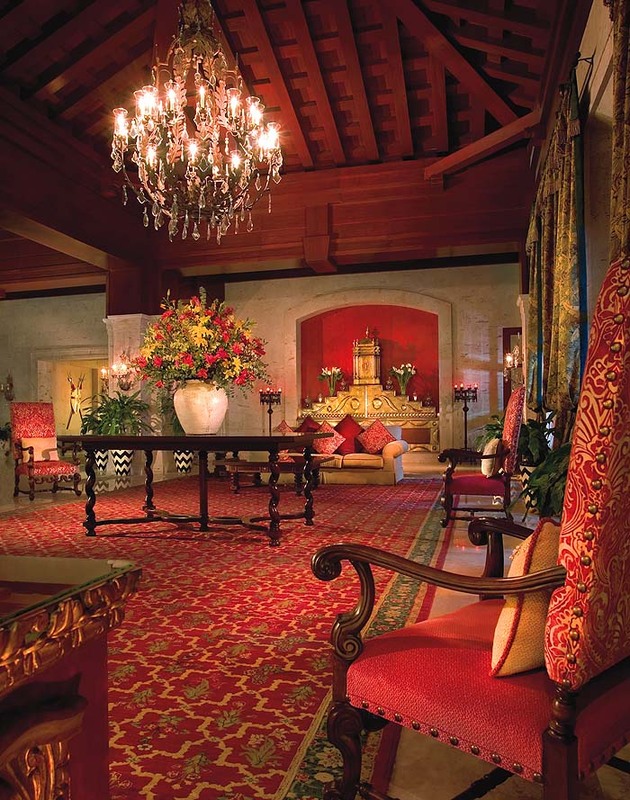 The Pueblo Bonito Rose Resort & Spa is that Romanesque in feel. Marble busts of Roman emperors. Florentine columns. A tall statue of Neptune standing over a blue-tile reflecting pool. But then, to mix it up a bit, the interior decorators hung Flemish tapestries on the walls of the marble-floor lobby. Among the 260 suites are studios and 1-and 2-bedroom units, all with kitchenettes (no ovens), TV’s, balconies and red Mexican tile floors. Suites are larger than at the Blanco next door, and (unlike the Blanco) bedrooms in the 1-bedroom units (luxury and master suites) face the ocean and long inner courtyard with pool. Pink and rose colors predominate. There are pink pool and beach chairs, and a pink-hued spa offers massage, facials and other beauty treatments. Fitness buffs have a good gym they can use, especially helpful to work off those extra calories gained from creamy take-out cakes sold in the resort’s deli. Pueblo Bonito Rose reviews on TripAdvisor and elsewhere usually always point out the prime location of the Rose (and Blanco). It’s right on Medano Beach. And we especially like that you can walk to town to try out various restaurants for dinner without having to bother with getting a taxi all the time. Pueblo Bonito Blanco vs Rose? If you’re trying to decide between Pueblo Bonito Blanco vs Rose, well, that’s a tough (but nice) choice! See which one we like best at the end. Also read the comments at the bottom of this post – they’re helpful too. Book Pueblo Bonito Rose now! You enter the Pueblo Bonito Sunset Beach Golf & Spa Resort through a grand marble lobby with chandeliers, 17th and 18th century art, and oversized colonial Mexican furniture. Beyond the lobby, hacienda-style villas cascade down a hillside toward the Pacific ocean. They house 327 suites in different sizes, each appointed with kitchenettes, marble baths, cedar woodwork, and feather-top beds. Just be prepared to walk a lot among the flower gardens, waterfalls, and fountains (or call for a golfcart ride). At 50 acres (and with no less than six outdoor pools), this is a big property! For a little pampering, visit the Armonia Spa. It’s been voted Mexico’s No. 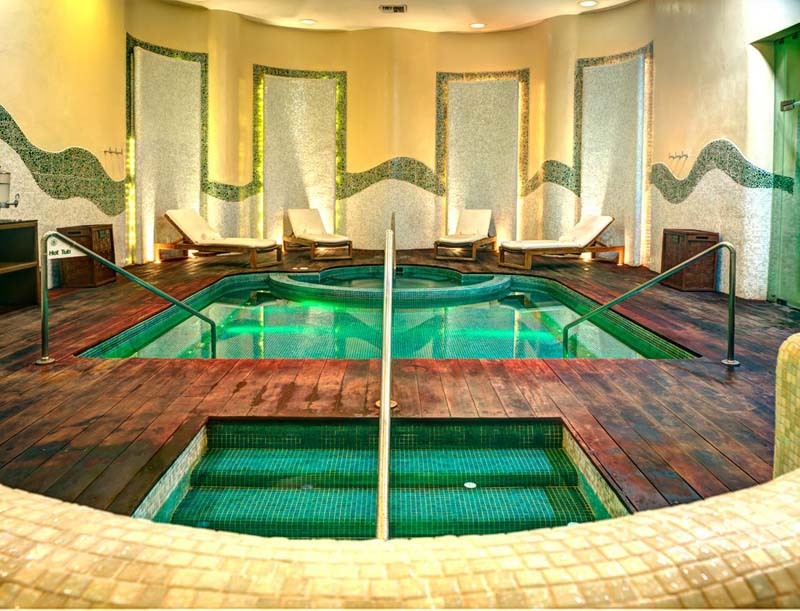 1 “top hotel spa” on the Travel + Leisure’s World’s Best List; Condé Nast has named it one of the top 20 best spas in Mexico and Central America. 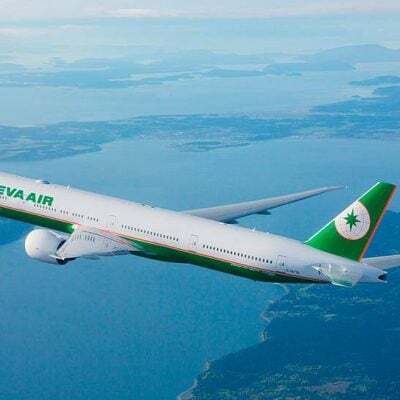 See TripAdvisor reviews here. Try the hot desert stone massage – 80 minutes of bliss. See this location map of the Pueblo Bonito Sunset Beach Resort & Spa below. You can zoom in for a close-up view. Be forewarned that this resort does not front a swimming beach; most Pueblo Bonito Sunset Beach reviews will note this. 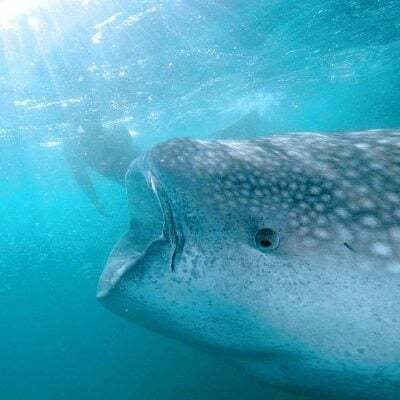 What things are there to do in Cabo San Lucas (other than going to the beach) for water lovers? Click here! As you can see from the above map, the resort is located on Cabo’s Pacific Ocean side. The waves here can be killer-high and a strong undertow makes swimming deadly most of the time. Book Pueblo Bonito Sunset Beach now! Pssst! 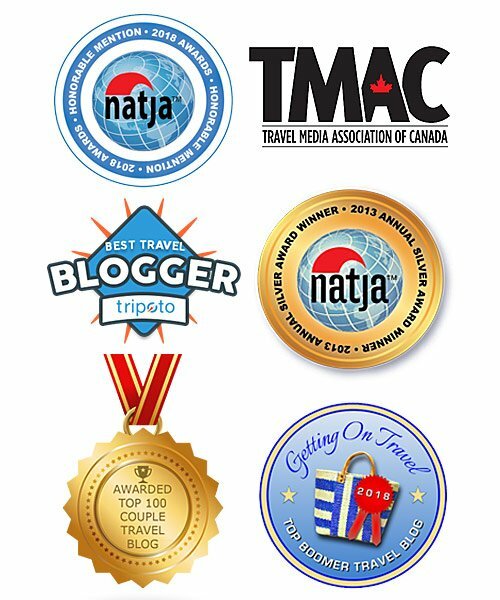 We’ll earn a tiny commission (at no cost to you) if you book a hotel on Booking.com through our site. Thank you :-). As a guest, you can use the free shuttle which takes you to other Pueblo Bonito resorts. Then every hour from 11:00 am to 10:00 pm (there’s also a 5:30 pm shuttle). The shuttle leaves every hour, on the half hour, until 10:30 pm (there’s also a 6:00 pm shuttle). A complimentary shuttle leaves every hour. 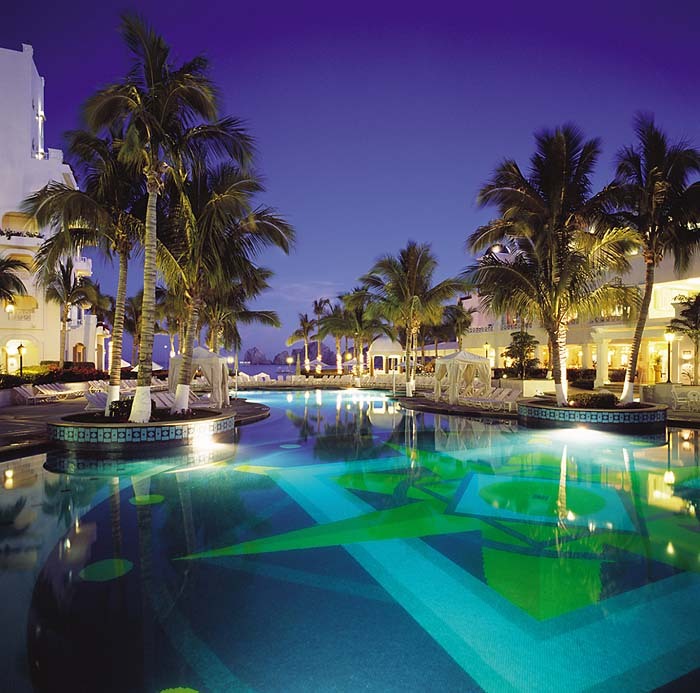 We think Blanco is the best Pueblo Bonito resort in Cabo San Lucas – it’s our personal favorite! Curious about other resorts in Los Cabos? Check out our guide to these 11 great boutique and luxury hotels! Find this post helpful? Then pin to Pinterest so others can see it too :-). 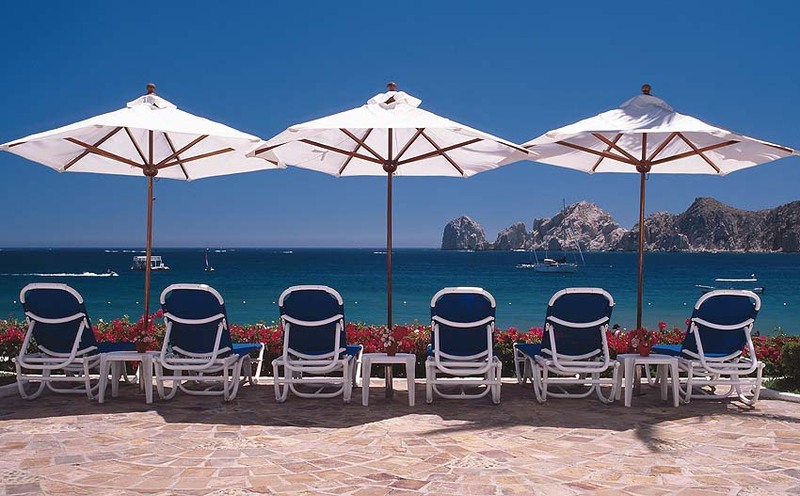 We’ve been fortunate to visit and write about Los Cabos many times, and we’ve reviewed many of the area’s hotels and resorts for various magazines and our blog. At the Blanco and Rose resorts, we paid for our stays, and Pueblo Bonito resorts didn’t pay us to write these Pueblo Bonito reviews. I will be staying at Sunset in June… can you give me information on how the inclusive works. Like what is included and how do they know who’s entitled to it? We are staying at blanco and our friends are staying at sunset. How far apart are these resorts from each other? Thank you for the article, it was full of great advice. See the website with the shuttle info. We are planning a stay at the Montecristo Villas. Can you rec your fav place to eat. Any of the favorite activities!? Hi! Thanks for the great Pueblo Bonito tips. Wondering if you could give more insight to the master suite at the Blanco. We’ve stayed in the luxury suite before, but besides another bathroom, could you describe how much more room this suite has than the luxury ones? We will have 5 people in my party travelling this year. Hope its a little roomier. Can’t get much details from the internet. Sorry, but we can’t say; just don’t have that info at hand… Can you email the resort and ask? Or you can phone: 1-800-990-8250 (for the U.S.) and 1-855-478-2811 if you’re in Canada. Enjoy your trip, Jenn! Hey there! I’m very excited to have found your article on Pinterest. We leave on May 20th for our vacation to Blanco. So thank you for all your information. We are a family of 4, my husband, myself our sons are 20 & 17. We’ve booked all inclusive through Bookit and feel our price is exceptional. Do you have any advice on getting an upgraded room? Is there anything else we need to be aware of or be sure to do? What are your thoughts on the most valuable excursions (the guys want to deep sea fish)? Congratulations! You should have loads of fun :-). The water should be nice and warm for swimming! 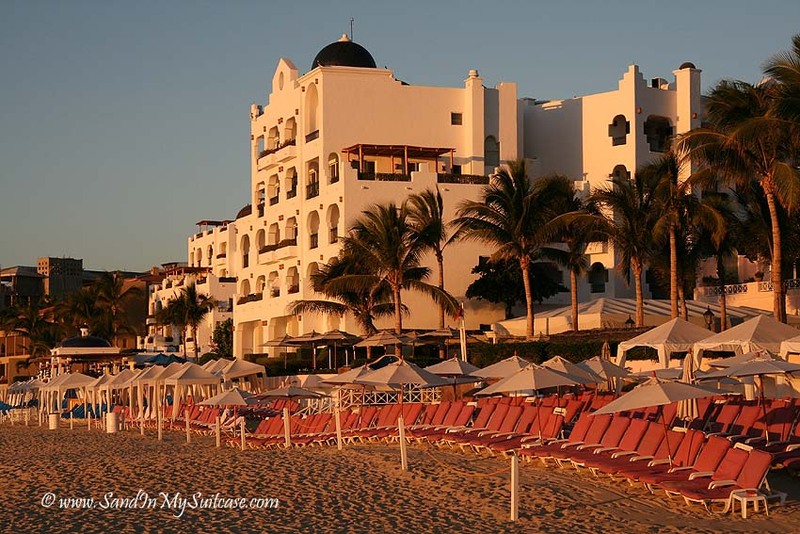 We stayed at Pueblo Bonito Sunset beach last year with our 2 kids. We actually loved that the resort was so big and a bit away from Cabo. We were upgraded to a suite that had our own private hot tub on the deck which we used every day and night! Do you know if any of the other Pueblo Bonito resorts have suites that offer a private hot tub? We want to go back this summer and looking for other resorts as well. Thanks! Great to hear you loved the Pueblo Bonito Sunset Beach! It’s one of Cabo’s nicest resorts. We don’t know off-hand whether the other PB resorts have suites with private hot tubs. Can you email or call them? That way, you’ll hear right from the horse’s mouth and get the suite you want :-). We got married in Cabo 10 years ago and we are heading back with some other couples to celebrate. I booked at the pueblo bonita pacifica and didn’t realize that they had different places. The sunset looks amazing too. Between the two, which one would you recommend for about 5 couples in their mid 30s?? Thanks so much!!! How nice to spend your 10 year anniversary in Cabo! Great spot – to get married, and to celebrate an anniversary! Well, there are four Pueblo Bonito resorts in Cabo, but the Pacifica is the only one that is purely adults-only and all-inclusive (no kitchenettes). It depends if you want everything done for you (all meals, drinks, etc.). The Pacifica will certainly give you that kind of pampering. And many of your fellow guests are likely to be in the same age range. Whatever you choose, you should have fun :-). 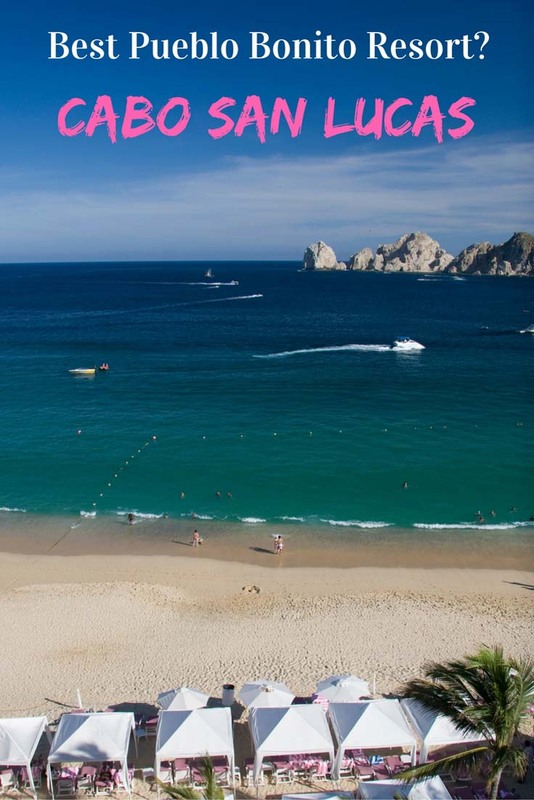 Los Cabos is a great destination for a sun-and-sand holiday! 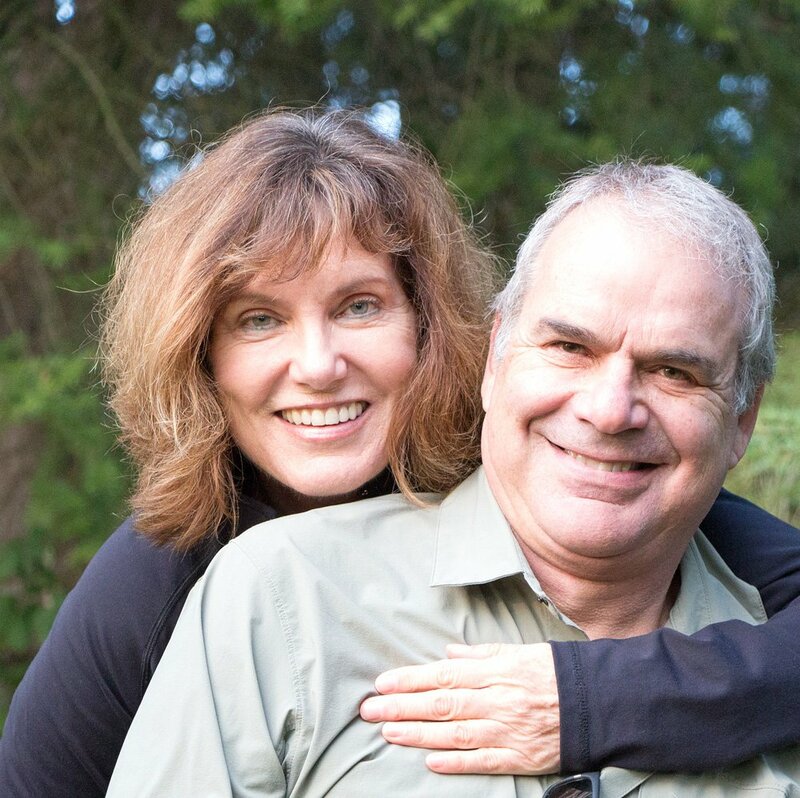 There’s lots to do – from whale watching (in winter), terrific snorkeling and scuba diving (October/November is the best time), golf, sailing, etc. It’s a fairly high-end destination, with many deluxe properties – and it’s the most expensive of the Mexican beach resort destinations. Many Americans from L.A., San Francisco and elsewhere jet down here (celebrities love it too), so it’s not as “Mexican” as other Mexican resorts – which you might like, or not… :-). What about bringing kids? We have 2 teenagers and a young child and are looking for somewhere that allows both to have a good time along with my husband and I. Any preference? Does Blanco have beach access and is the water swim-able there? Absolutely! Kids and teens are both sure to have fun (as well as you). 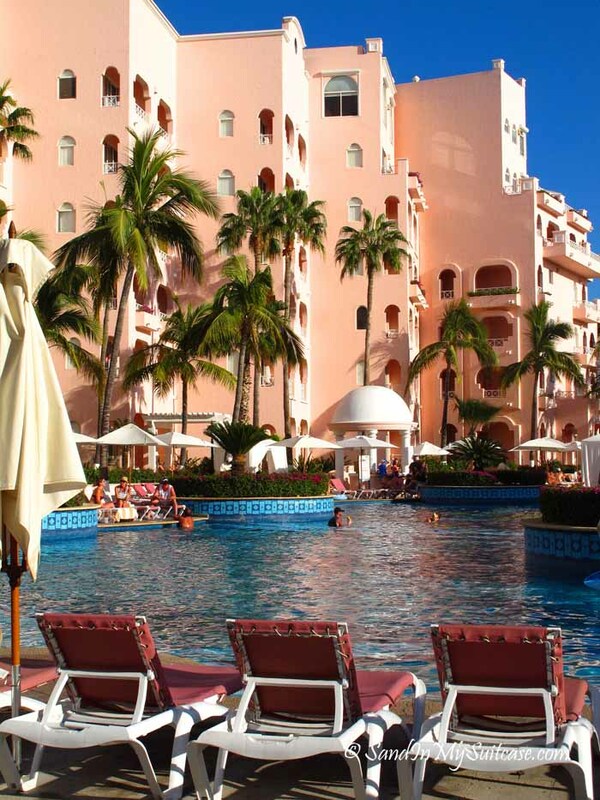 The Pueblo Bonito resorts are family-friendly (except the adults-only one). Blanco has great beach access – it’s right on Medano Beach and the beach is very swim-able. Many people choose the hotels along this stretch of Medano Beach because it is swim-able (one of the few and one of the best swim-able beaches in Los Cabos). we’ve stayed at the Blanco twice, but were on a waiting list for both this year, and as luck would have it, the Rose popped up first, so we are staying there this time. We have done the all-inclusive route both times at the Blanco, and paid directly to PB to do that. Do you know if you can purchase the all-inclusive meal plan through a third party vendor to save $, or can you only do that through PB? You’re sure to enjoy the Rose as much as the Blanco :-)… But we don’t know the answer to your question about buying the all-inclusive plan through a third-party vendor, sorry! If you don’t want to go all-inclusive, Cabo has some great restaurants you can walk to (or cheap taxi ride). So that’s an option :-). Have fun on your trip! Hello! Which resort would you recommend for a honeymoon? My fiance and I will be taking our honeymoon in December, and we are having a lot of trouble deciding! Trying to decide between Blanco and Rose. Needing a Master suite (one bedroom). Do these have balconies that face the ocean? Also, what floor would be the best to be on for the view? Which resort is closest to the action’? (LOL we have two teenagers). thx! Yes, Master suites at both resorts have balconies facing the ocean. A higher floor will have the better (more expansive) ocean view. The Rose has a more compact beach area, but more space around the pool for lounging. It’s more modern in design (not as Mexican traditional as Blanco) and the bedrooms face the ocean (whereas the bedrooms at Blanco don’t have ocean views, just the living rooms). 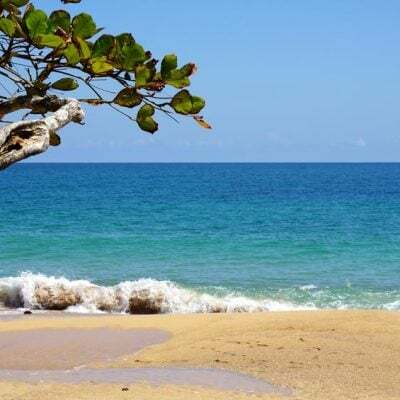 The Blanco has a wider beach area and is also a few steps closer to the action of Mango Deck and the “busier” beach scene (rentals of wave runners at Tio Sports, etc.). It’s a tough choice though, because both are great properties! Remember also that you can hang out at either property – and take the shuttle to go to Sunset Beach. So you can’t go wrong, whatever you choose :-). Have fun! 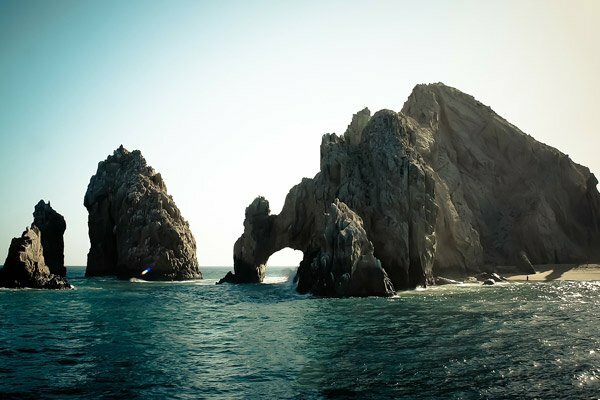 We just got back from Cabo – and it’s as beautiful as ever! 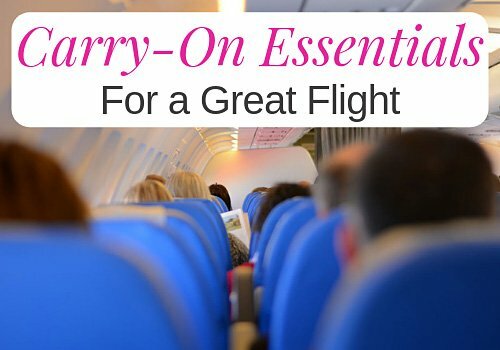 Is an all inclusive worth it or can one rent a car and go shopping? Oh, for sure, you don’t have to get the all-inclusive package if you stay at Pueblo Bonito Rose, Los Cabos or Sunset Beach! You don’t even have to rent a car to go grocery shopping – a taxi to Walmart or Costco is only about $10+ USD. If you’re coming from the airport, you can ask your taxi or transfer service to make a grocery stop on the way to your resort (usually a small extra charge). 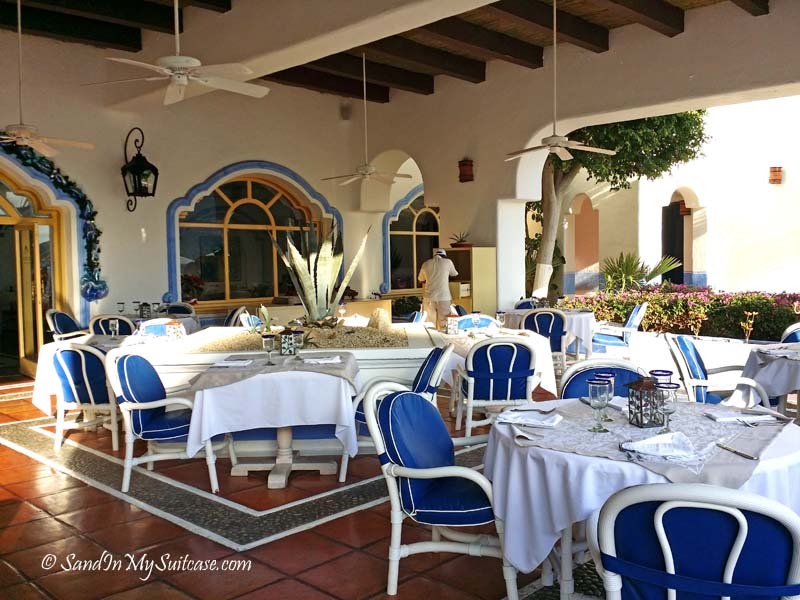 We probably wouldn’t get the all-inclusive package, as we like the freedom to eat in our own place when we want, and besides, there are so many good restaurants in Cabo, it’s nice to have that freedom too to eat elsewhere. If you book at the PB Rose are you able to use everything at the PB Los Cabos (restaurants, bars, pool, etc)? Exotic and amazing, that’s the best tourist spot in Mexico. Wow. I love Cabo. Great pictures. Cabo was an amazing experience for me and my family. I want to back there. I think Pueblo Bonito is an amazing resort. Thanks for sharing the pictures and info. Glad you like Cabo! It’s one of our fave beach destinations too. Easy to get to, and the weather is usually reliable! I can get back there next year.